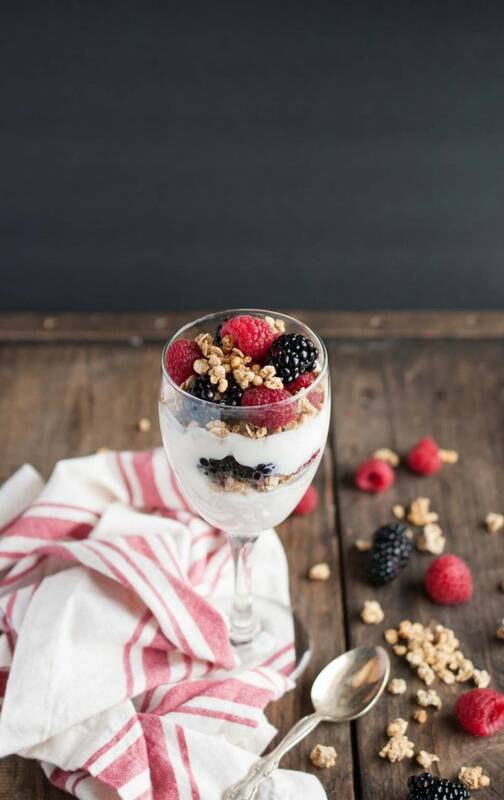 You are here: Home / Recipes / Breakfast / Yogurt Parfait – Just Three Ingredients! Yogurt Parfait – Just Three Ingredients! 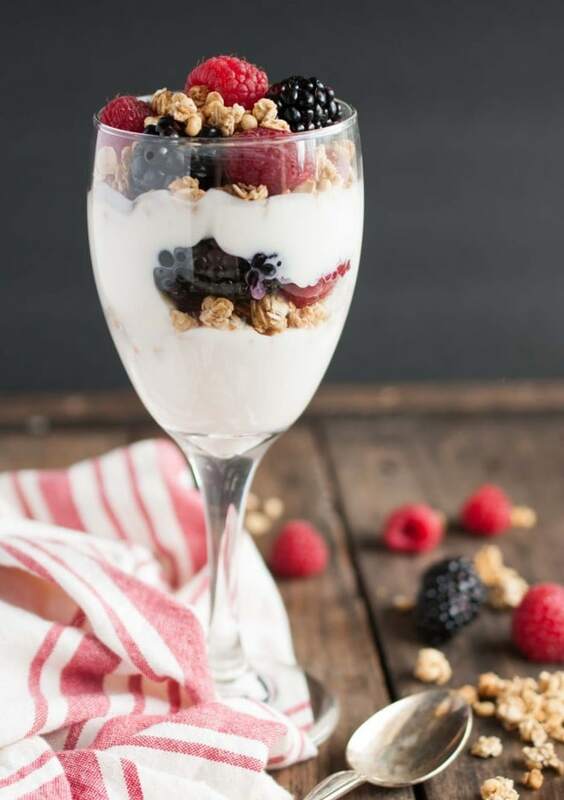 This light and healthy yogurt parfait with berries feels fancy but can be made in five minutes or less with 14 grams of protein and only three ingredients! Ready for a recipe so easy, its barely even a recipe? Enter the yogurt parfait! 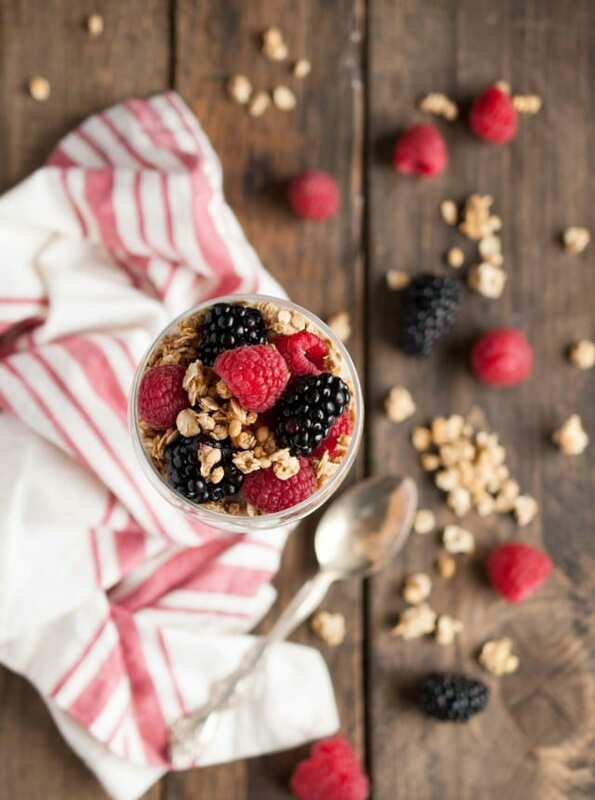 I can’t think of a breakfast that energizes me more than yogurt, granola, and berries. Its light enough that you don’t feel weighed down and filling enough that you won’t need to snack until lunch. I use protein granola a lot of the time to make it even more filling. For a real treat, this chocolate coconut granola is to die for! Or I have a salted chocolate version that might be my favorite thing I’ve ever eaten. Its a bit less healthy, but life changingly delicious. Over at our house (affectionately dubbed ‘hotel de Gurin’), we have a steady stream of house guests that stay with us while passing through town. Pretty much everyone wakes up hungry in this house (probably from too much wine the night before) so breakfast goodies are always welcome. While I love those long drawn out weekend brunches with all kinds of filling carbs like these pancakes, they aren’t as conductive to getting you pumped up and energized for the day. Heavier breakfasts are tasty and have their place, but just aren’t practical for every day mornings where productivity is needed and naps are not possible. So, for days where you need to be light on your feet and out the door in under 10 minutes, this is the breakfast you need. And as a bonus, the layers make it super pretty. Pinkies up! I wasn’t lying when I said three ingredients. I used Chobani vanilla Greek yogurt since its full of protein and lower in sugar than other brands. Some of their yogurts taste kind of chalky to me, but the vanilla one that comes in large multi-serving containers is excellent. You can use your own favorite yogurt though. If you’re using plain yogurt, you’ll need to doctor it up with some honey first to make it sweeter. You could even drizzle honey over the top to make your yogurt parfait more decadent. The type of berries you use is up to you. I used blackberries and strawberries, but use whatever you want here. Strawberries, blueberries, anything works. Banana is a good alternative too, if the berries aren’t looking too hot this time of year. So far I’ve given the yogurt parfait a lot of play as a breakfast option, but these make a great dessert too. For those times when you want a nutritious snack that hits all the right sweet spots, these sub in pretty seamlessly for dessert. No, it isn’t chocolate cake, but it is sweet and sometimes that’s all I really need. And at 280 calories, this is a far better (and more filling!) dessert than pretty much anything else I can think of. You can even trick kids into thinking a yogurt parfait is dessert. True story – it worked! Something about the fancy presentation makes them think its something special. And not to mention how much better a kid will feel and act after eating a yogurt parfait instead of candy or some other sweet snack. Set your kiddos up for success with lower sugar options that won’t leave them crashing and cranky. Or if you’re an aunty like me, you can always wind the kids up on sugar and then send them home to mom. That’s a special privilege us aunties have, but one that you don’t want to abuse too often. For those non-spoiling times, choose a yogurt parfait or other healthy snack. Moms everywhere will thank you for this wise decision. If you follow me on Instagram, you probably know that I’m in Whistler right now, skiing the days away. Well, we haven’t gone yet but plan to tomorrow and the next day before making the trek home. To put it in perspective how cool this place is – the main lift is a two minute walk from our hotel, right in the middle of the village. Two minutes! The town is set up as a European village with shops and restaurants lining cobblestone streets. Its the closest North America can get to the alps. All kinds of adorable. Then, five days after going home, we’re off to tropical weather. Our Costa Rica trip really snuck up fast! After that final trip, its back to life as usual. Not that I’m complaining. Life as usual is treating me pretty good these days. 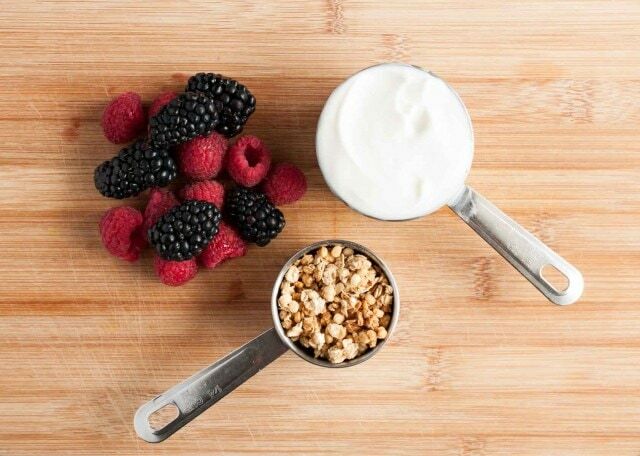 Yogurt Parfait - Just Three Ingredients! This light and healthy yogurt parfait can be made in five minutes or less with over 14 grams of protein, 9 grams of fiber, and only three ingredients! Spoon half of the yogurt into a see through glass. Top with half of the granola and then half of the berries. Repeat with remaining yogurt, granola, and berries. Enjoy! This looks so much fancier than my 3 ingredient parfait which is dump and stir method lol! Love this simple idea for a perfect afternoon snack! Yogurt parfaits made with greek yogurt are super filling and yummy!